The bell curve is a good indicator of where to expect performance from your employees. 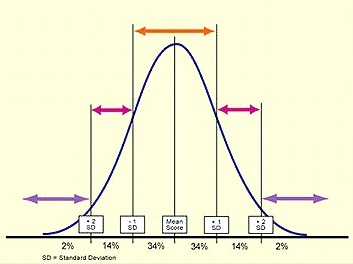 The bell curve is the normal curve used to show the average and standard deviation of a set of data points. With the bell curve, 95.4% of the data falls within two standard deviations. When it comes to employee performance, how does the bell curve apply? Employee performance within a particular system should fall within the bell curve. Sometimes employees will perform a little above average while other times employees will perform a little below average, but their overall performance should all fall under the curve. The real learning comes from the outliers. When people underperform or overperform significantly, there is a factor that led to their performance. Sometimes they lack the proper training, while other times they may not understand the training they received. For new employees, there is also a time when they will underperform because they are still learning their position. As they learn their position, they should perform within the limits of the bell curve. There are also other factors that may lead to underperformance/underproduction such as health, family situations, etc. When the performance/production level falls outside the bell curve, the leader should diligently work to identify the cause. Once the cause is detemined, the leader can figure out the solution to the problem so the performance can return to within the curve. There are some cases where the employee is doing something that leads to their underperformance that they don’t want to stop. They have chosen not to follow the established system and they are falling behind. In those unfortunate cases, the leaders may be forced to terminate the employee. In addition to underperformance, there are also cases where people significantly outperform the system. There is also a lot to learn from these situations because they must be doing something outside the defined system. They may be working longer hours than everyone else, skipping steps within the system, or they may have figured out a more efficient method to complete the work that is not included within the framework of the system. Once a case of out performance is identified, the leaders must identify contributing factors so they can implement them within the entire system. When it comes to performance, there is always a factor that leads to underperformance or overperformance. The responsibility of the leader is to identify those factors and either correct them or implement them system wide. By doing that, the company will have much more success and overall performance will improve. What do you do when you see overperformance or underperformance? How do you identify the cause? Please share your comments in the comments section below!